It's been one of those where-did-I-put-my-Superwoman-cape? kind of weeks. You know the kind, don't you? The kind with special occasions to mark and special preparations to make and special measures to take. The kind that starts with good and wholesome desires but that can all too easily leave me feeling as though I need to be locked up in a special kind of room--the kind with padded walls. But something important happened to me this week. By the grace of God, in the middle of one of the busiest days, a friend asked how I was doing, and I answered honestly: "Frantic." My friend pressed for details, and I shared them: in addition to the normal activities and responsibilities of the week, my son was turning 21, I was hosting a large dinner party for some important business associates of my husband's, I was preparing for an important Board meeting, and I was getting ready to be away from home for a week. With a haircut and a dentist's appointment thrown in for good measure, I had way too many things to do and not enough time to do them, at least not the way I wanted to do them. My friend prayed for me, and I felt the stress of my busyness melt away as I remembered the truth: that the reason I was doing all these things was to bless people, not to impress them. There was no need to be frantic. Yes, I had a lot to do. And yes, I wanted to do a good job. But the purpose of my doing all these things was to be a blessing to people, and my being frantic would not be a blessing to anyone, including me. So I made some adjustments--a few to my task list, and a lot to my attitude. The centerpiece for the dinner table, for instance: I simply placed some hydrangeas in a crystal bowl and lit a few candles. It was simple and beautiful. I cried a little, and I laughed a lot. I asked for help, both from God and from people. 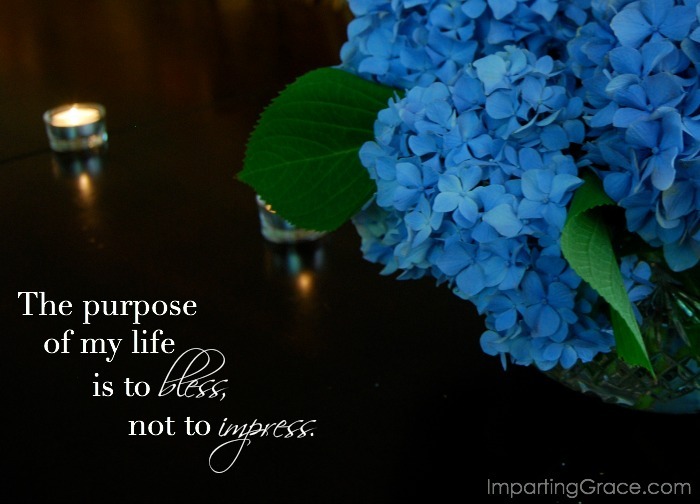 In short, I left the business of impressing people up to God, and I just tried to bless them. And my week with too much to do and not enough time to do it turned into a week of truth and goodness and beauty and--dare I say it?--fun! How about you? Do you ever get overwhelmed with your to-do list? Can I pray for you? Thank you so much for the gentle reminder! I love this Richella. I am often guilty of doing this... of making things more about me. Thank you for this beautiful reminder, sweet friend. Such a beautiful post. God Bless. Thank you for this post. And although the many things you mentioned are important, the thing that has side swiped my purpose in life has been the decisions being made by grown children. Of all the investments being made, these have been the most important. And watching someone you dearly love jump off a cliff has crushed my heart. And although you don'e know me, yes, I would appreciate your prayers. So encouraging. I want to bless others with my life, and stop trying to impress everyone, and live up to a standard (that I've set myself) that is impossible to reach. 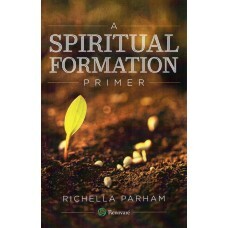 I LOVE this, Richella! I would love to use your phrase for a courage for the week, it that's okay. Especially today as I'm rushing around before company comes, that is a perfect motto for me to remember. I need to try your key lime pie, I am a limehead and it looks divine. I love how your island turned out as well, please know that I read every post, I have been such a slacker on commenting these days. Love you! Dear Richella - I totally understand that feeling of being overwhelmed with too much to do, the way I want to do it! Your post is a good reminder to stop and just breathe a prayer. Even when it seems like there isn't time! 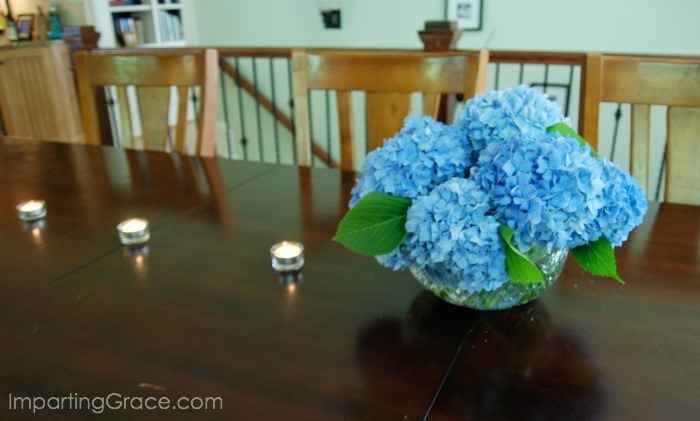 Isn't it great that God gave you the beautiful idea to use candles and hydrangeas? He is so creative! Yes, please pray for me!!!!!! Love that simple table centerpiece! It looks so soothing and calming. Yes, you can pray for me to once and for all know what direction I need to go and focus. I'm feeling overwhelmed by a to do list, but also because I just don't have a clear vision. Thanks!